The Philadelphia Inquirer published this commentary by Freedoms Foundation Executive Vice President Jason L.S. Raia on March 28. The College Board – those responsible for the SAT and Advanced Placement tests – has identified two important areas of study that prepare high school students for success in college and beyond: computer science and the U.S. Constitution. The first seems obvious in a world where almost everyone has a super computer in their pocket. But how will a 243-year-old document help kids in the 21st century? Simple, really. Constitutional issues impact our lives every day. And Constitutional knowledge, especially in 2019, has a transformative power that allows young people to understand how they fit into the world around them — and the role civic responsibility plays in American society. I’ve seen it happen over and over during my dozen years of educating students about American rights and responsibilities rooted in the Constitution. 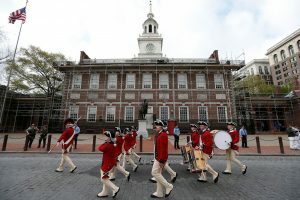 The Founders who gathered in Philadelphia bequeathed to us a representative form of democracy that functions best with an informed citizenry prepared to instruct the government, and not the other way around. Under our Constitution, individual rights are not granted by the government but protected by it. Without a working knowledge of our form of limited self-government, the people – from whom all power and authority emanate – can easily be left outside looking in.